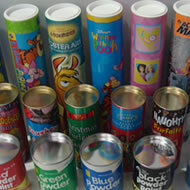 Composite tubes offer a unique combination of product protection, product promotion and reusability. No wonder that at one time or another all the major food and drink manufacturers have adopted this form of packaging for their premium lines and special promotions. Typical food applications include biscuits, tea, coffee, custard powder, christmas puddings, cakes, gravy granules and salt. Our customer list also includes suppliers of confectionery and chocolates as well as whisky, wine, liqueurs and home brew kits. Diameters range from 40mm to 99 mm and lengths are generally in the range from 80 to 200mm and we could supply up to 990 mm if needed. 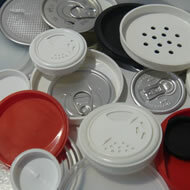 A variety of lids are available from the embossed metal lids to simple push fit plastic lids. 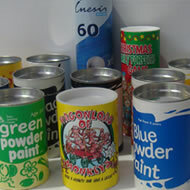 For tamper proof tubes we can offer ring pull style lids or aluminum foil membranes. 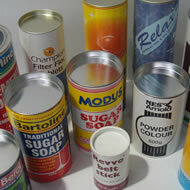 In these cases the base would need to be sealed on to the container after filling. Products for the horticultural sector. 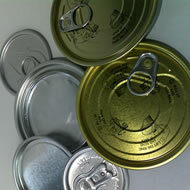 the pet and livestock market as well as the building market all lend themselves to composite packaging. With the cardboard tube providing the strength and durability, the lid can be designed to provide a convenient way of dispensing the product. From colouring kits to trivia games, the beauty of composite tubes is that articles of completely different shapes and sizes can be packed inside a single container. 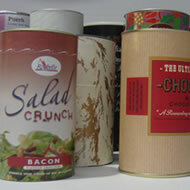 This saves on complex packaging lines and gives plenty of room on the outside to describe and promote the product.